Lie on a bench with handles at one end. If no such bench is available, use a bench with a sturdy pad that you can lightly grab for stability (this exercise can also be performed on the ground if no bench is available). With both hands, reach behind your head or at the sides of your head and grasp the bar/pad (if no bench is available, keep the hands in front of the body and to the sides with palms flat on the ground). Bend your knees as much as possible and position them so they are pointing up. Bring the heels of your feet at close to the buttocks as possible without raising your pelvis off the bench/ground. Be sure to keep the feet flat on the bench/ground. This is the starting position. Draw the knees toward your face, rounding your back as you do so, while concurrently bringing your pelvis/buttocks off the bench/ground in a crunching motion (exhale throughout this motion). 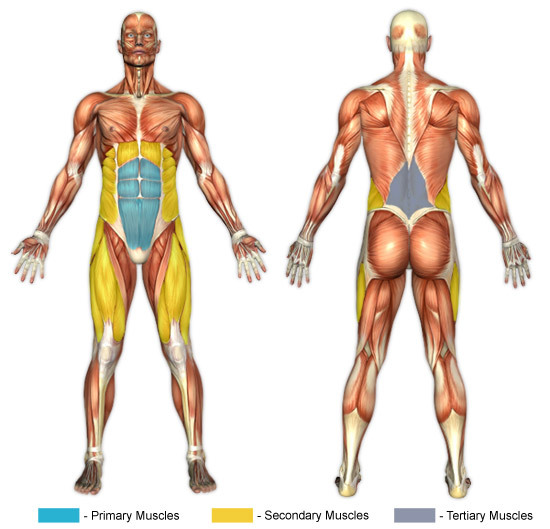 Briefly hold the position when you reach the top and contract your abdominals muscles. Slowly lower your knees and buttocks in unity until your pelvis meets the bench/ground again (inhale throughout this motion). Do not allow the feet to touch the bench/ground until all repetitions have been completed. Keeping the movements controlled and deliberate for this exercise is necessary to achieve optimal abdominal recruitment. Many exercises involving the abdominal core (particularly the rectus abdominis) call for rounding the back. Indeed, this is likely contrary to advice that you have heard for weight lifting in general, but, in the case of exercises that focus on the aforementioned muscle group, rounding the back is recommended to prevent injury. It is easy to start a rocking motion while performing reverse crunches. Do not use momentum to lift the knees toward the face.